It is just sugar and water boiled together. This liquid substance has all the same sweetness of granulated sugar. It is the secret ingredient to the best cold homemade beverages, cocktails, and other drink recipes. It is so much easier to swirl in a prepared translucent liquid than it is to add sugar directly, because the granules don’t need to dissolve. It is a basic and indispensable ingredient of cocktail making. Simple Syrup has a multitude of uses and is a great addition to mixed drinks, tea, and coffee! It is perfect for sweetening your cold drinks where regular sugar wouldn’t normally dissolve with ease. You will find many uses for simple syrup in your cooking, as it can also be used in sorbets, candying fruits, moistening sponge cakes, etc. With these easy-to-make recipes below, you can make as small or as large a batch as you wish and store it in the refrigerator in a well sealed bottle. It takes less than 5 minutes to make Simple Syrup. So, never purchase it from a store again and do not ever pass up a recipe calling for simple syrup. They don’t call it “simple” for nothing! Thin Simple Syrup – A ratio of 3 parts water to 1 part sugar – used to glaze cakes and cookies. Medium Simple Syrup – A ratio of 2 parts water to 1 part sugar – used to make sweeten beverages and iced tea. Thick or Rich Simple Syrup (basic simple syrup) – A ratio of 1 part water to 1 part sugar – This is used as the basis for cold fruit drinks and cocktails. Also used to make candied fruits. Bartenders usually prefer this simple syrup for cocktails. NOTE: Decide which type of Simple Syrup (thin, medium, or thick) you want to make to determine how much water and sugar you need to use. See Types of Simple Syrup above. 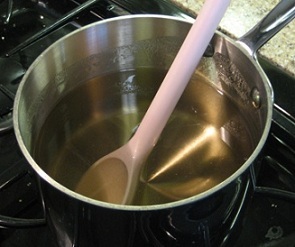 In a high-sided saucepan over medium-high heat, bring cold water and sugar to a boil. Turn the heat to low and stir constantly until the sugar dissolves completely and the mixture is clear, approximately 3 to 5 minutes. Remember – the longer you boil it, the thicker the syrup will be when cooled. To test if the sugar is completely dissolved: Using spoon, scoop up a small amount of the syrup. You should not be able to see any sugars crystals in the liquid. If you do, boil a little longer. Optional: At this point you can add flavorings (see below for ideas). After boiling, let the syrup cool to room temperature, then pour into a tightly sealed, clean glass jar and store in the refrigerator (Any clean and sealable container can be used). Storing Simple Syrup: Sugar is a natural preservative, so Simple Syrup keeps for a while in the refrigerator. Eventually mold will begin to grow if stored too long. You can also stir in 1 tablespoon corn syrup to help ensure the syrup stays smooth. You can also flavor your Simple Syrup in many interesting ways with the addition of herbs and spices. Infused Simple Syrups will work and taste fantastic in just about any summer cocktail. Be creative! Lemon, lime, orange, and/or grapefruit zest and/or freshly-squeezed juice, whole cinnamon sticks, whole vanilla bean (split open the beans,) whole cloves, whole cardamom pods, culinary lavender (fresh or dried – great in lemonade), basil leaves, ginger root (peeled and cut into rounds or coarsely chopped), mint leaves (I usually keep a bottle in my refrigerator for making Mint Juleps an Mojitos during the summer), rosemary sprigs, fresh eucalyptus, peppercorns, chili peppers (fresh or dried), rose water – substitute some of the water with rose water (make sure you use food-grade rose water that is OK for consumption, some are not), any sort of fruit or vegetable (fresh or frozen), green tea (substitute prepared green tea for the water). Just add the flavoring (of your choice) once the water and sugar are done boiling and removed from the heat source. Let sit approximately 20 to 30 minutes to infuse the Simple Syrup. Using a wire mesh strainer, strain out the flavoring before using or storing. Some people like to simmer their flavorings when the sugar and water boils. Popular Recipes That Use Simple Syrup? Basic pastry-making staple – A cake baker’s trick: Lightly brush simple syrup on each cake layer before frosting. Simple syrup is used to keep cake layers moist for long periods. Can you use liquid sugar in hot beverages as well? Yes, you can use liquid sugar in hot beverages. I have never heard of ice lollies before. They sound interesting. Are they like an American popsicle? My sister-in-law rolls sliced apples up in biscuit or pie dough, then slices into rounds, puts rounds touching into baking pan and covers with a sugar/water mixture and bakes. Is this possible the “syrup” she uses? That sure sounds like Simple Syrup. Great idea! What is the name of the author / editor of this website? Just want to do better referencing to what I got from this website. Go to the About Us section on the Home Page. Question: I dislike using corn syrup even when a cake frosting recipe calls for it. I want to make a marshmallow texture and tasting Icake frosting or icing with smaller portion of butter or margarine than the usual minimum stick of butter and no corn syrup. Can I replace corn syrup by using sugar syrup. And if so, do I use think, medium or thick? I bake small one to two layer cakes which provides me with single slice servings for a few days. And can I freeze cake slices with marshmallow type frosting? Appreciate response. Interesting idea, I have not tried this. Maybe another reader has tried it and can help us out. If you decide to give it a try, let us know how it works. Can you prepare simple syrup in the microwave? I have never tried. This is such an easy recipe to do on the stove top. Around how long is “a while” to keep the syrup in the fridge? I usually make only enough for my immediate needs. My guess is that homemade Simple Syrup will only last a couple of weeks. Would it be safe to process this to make it shelf stable? In a water bath or pressure canner?